Layered Materiel not rendering properly? I have problems doing layered materiel; i have a repeatable materiel and an asset materiel overlaying using a color mask however its not rendering properly. Im new to layering materiels, can someone help me out. Can you let me know what you are expecting with your Layered Material, it could be that your alpha texture input is backwards and you are rendering your top where you want you base and vice versa. 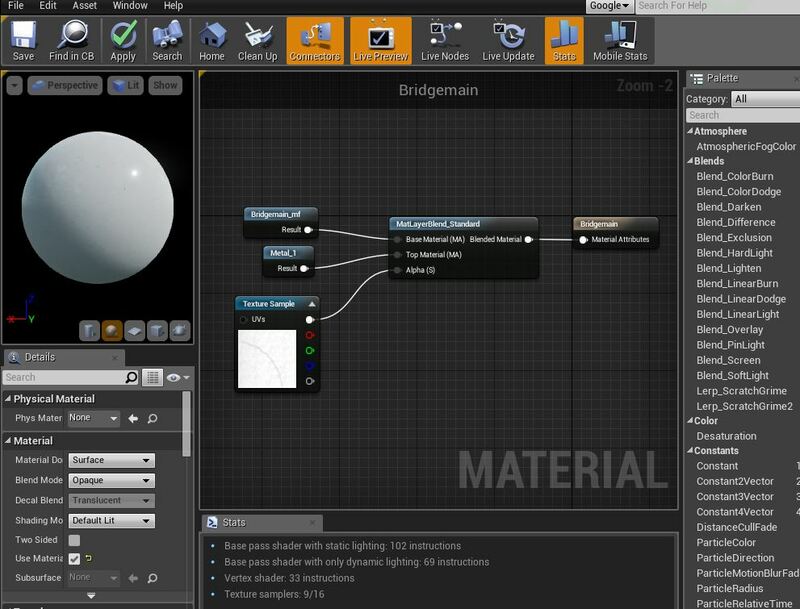 If you want the Materials to be blended directly on top of one another, use a Scalar Value of 0.5 in the alpha input instead of the texture Alpha. If you want certain places to be more of one material than the other use a LERP node with A set to 0.5 and B set to either 0 or 1 depending on whether you want to Base or Top Material to be more prevalent and the Alpha Texture plugged into the Alpha of the LERP. Finally, place the output of the LERP into you MaterialLayerBlend as the Alpha. If 0.5 into the both of the LERPs gives you the results you are after, then you can just plug in a 0.5 into the Alpha Value of your Blend, it will save a few instruction counts. Why does my decal look drasticly different like this?